"Luxuriate in the splendour of a gracious Georgian mansion (circa 1840) with a private cottage garden behind. Sip drinks under the spreading oak tree which, like the house, is listed by the National Trust. Escape all your cares in the lavishly decorated spacious apartments which are fully serviced each day. Wile away winter evenings indulging in the port and truffles provided and playing old-fashioned board games by your own log fire, listening to your favourite CDs or reading the excellent supply of old books. Relive the romantic elegance of an aristocratic life in the nineteenth century while enjoying all the comforts of modern times in this exclusive award-winning accommodation. Each apartment has been refurbished with its own distinctive character and astonishing attention to detail. The furnishings of the Countess apartment include a pink chintz lounge setting, marbled statues and a genuine antique pedal organ. The Baroness has a marvellous atmosphere of restrained affluence, with burgundy and navy the colours in the main room, highlighted with subtle touches of gold. The rich ambience of a gentleman's drawing room with period hunting prints and leather chesterfields graces the Duke of York apartment. Or you might prefer the tranquil calm of the Duchess of York with its lovely prints and antiques and period china pieces. A more rustic appeal awaits you in the Gamekeeper with hand-painted tartan walls and a genuine hunting horn. 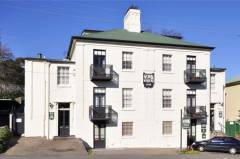 It will be hard to tear yourself away from this elegant mansion and friendly personal service, but the hearty breakfast provisions will give you the energy to explore the charms of old Launceston at your doorstep. The city centre is only a short walk away."